I'm not sure if double frame construction or single frame, but I assume only single frame given how cheap the build of this unit is overall. Bedroom 1 would still be an issue with my proposal, but i've pretty much abandoned this as just a storage room now. My only goal is to make a much quieter living room and Bedroom 2. I'm actually in Australia, so calling you would be difficult. Would you be able to give any general advice on this forum about sound proofing materials for inside wall or anything I should keep in mind when attaching wall to existing floor/ceiling etc? maybe some extra sound dampening matterial for the joins etc ? Hello again, So I have another idea: I found a very heavy fire door at my local salvage place and am thinking of buying it ($100) and using it as a second door, I don’t have room for the whole door to swing open so I’m thinking of cutting it in half and make 2 latching half doors with a lot of weather stripping and sealent, maybe even add MLV and perhaps rock wool in the gap if necessary, problem is the door is so heavy I can’t manage it myself, not sure even 2 people could handle it, do you have any advise for dealing with the weight of these doors ? I've posted before about sound issues and now I'm about to have some more. I know most of you will tell me to move but my lease isn't up till November so I'm trying to make the best of things until then. 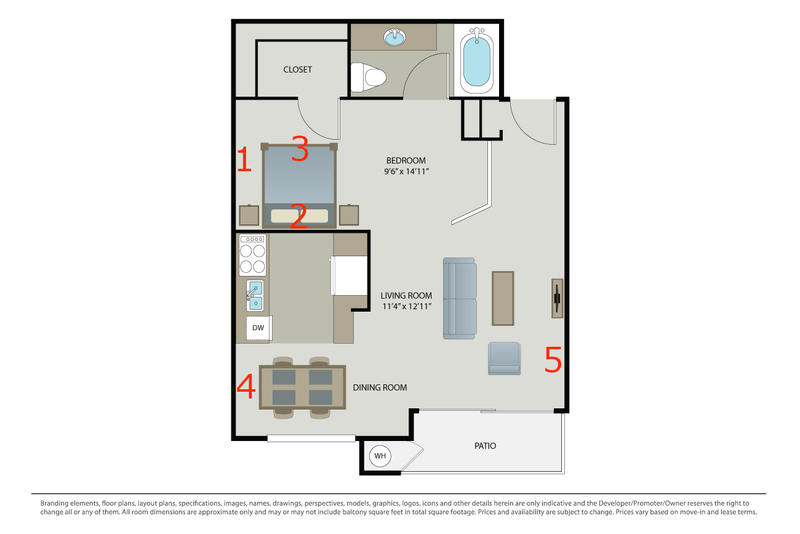 I'm going to attach a floorplan for my apartment with some numbers on it, then tell you about some issues I'm facing. My first and probably most important issue is getting decent sleep here. I have re-positioned my bed many times but haven't figured out an ideal way to handle some sound issues. Referring to the image above, at point 1 I currently have my bed positioned here. The problem is on the other side of that wall is a sliding closet door from another apartment. The thump from that door closing has woken me up many times - as well as another door closing not too far away. For the last year and a half, there has been no neighbor there so it has been wonderful, but new neighbors are moving in soon so I am coming up with a plan. At point 2 on the image is another place I can position the bed, such as in the actual graphics, which I have tried before. The problem here is that I can hear the "thumps" of cabinets closing from the kitchen from the neighbor downstairs. So yes, another 'thump' issue. At point 3, in the past I had put my head here just to avoid some of that noise but its really a bad solution. So odd not having a wall behind your head. So any ideas in other bed positioning or anything else to help me out with sleeping better? 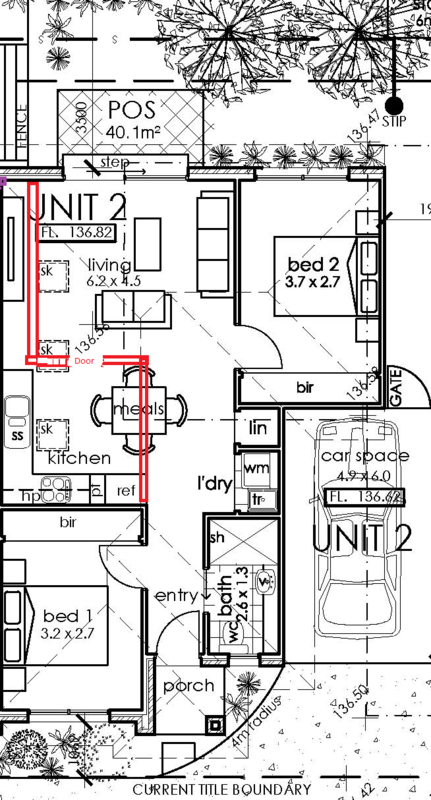 At point [ccolor=red]4[/color] on my floorplan is where I have another issue. I have my computer setup in the space where that table is on the image next to the window by the kitchen. At point 4 on the other side of my wall is a neighbor's sliding window. For years I've been startled by that window closing with a loud 'thump' while I am at my computer. I thought maybe of installing one of those 'hush bumps' inside of the track of the window as well. Of course, I will try to talk to the new neighbors and ask if they will close the window and their closet doors with less force but I've learned you can't count on that. Maybe I could hang something on the wall there to lessen that noise? At point 5 I've had issues with cabinets closing from a different neighbor's kitchen right on the other side of that wall. I tend to avoid this area. Believe it or not, I've been here 13 years now. Only recently did I realize how many issues I've had with this place. I know it depends on the person, but I'm definitely sensitive to these sound issues, whereas another person not be bothered. Anyone else may have moved already but I had chose not to. As I said earlier, I am much more open to moving now but my lease isn't up till November so I'm trying to make the best of things for now. So, any advice on helping me sleep better or to reduce the window closing issue I have near my computer? Definitely an interesting idea, do you know if the shared wall is a double frame construction or single frame? your idea has merit, I would be concerned about flanking noise to bed 1 but from what I see if the door in the kitchen is closed you would experience a good value of reduction from the kitchen area. Feel free to give me a call direct to discuss this project in greater detail.